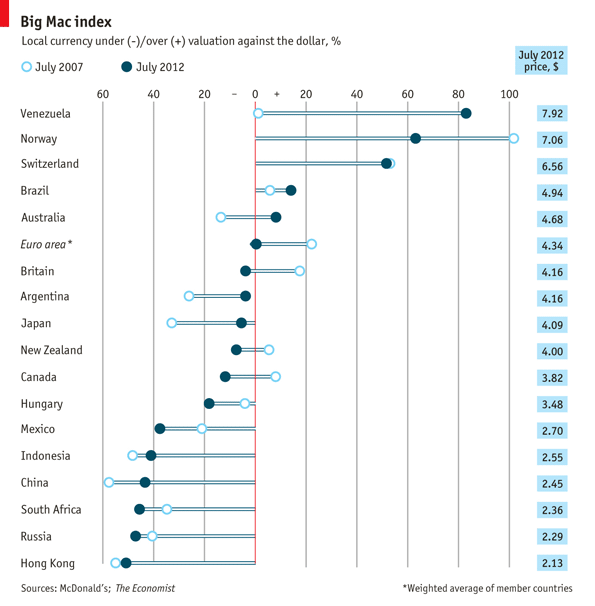 The Economist released their latest Big Mac index yesterday. This view compares the current value with that in July 2007. Curious to see the diversity in the BRICS (no measure this time for India – perhaps they decided that the Maharaja Mac is no longer fungible) – Brazil at a premium but Russia, China & South Africa all at discount in absolute (Big Mac) value, Brazil & China up and Russia & South Africa down in relative Big Mac value. According to my very brief currency rate comparison, only CNY has devalued since July 2007.